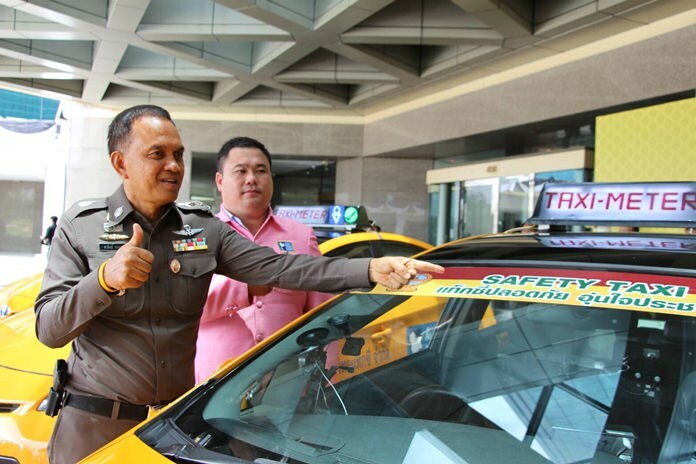 BANGKOK – The Royal Thai Police is promoting its ‘Safety Taxi’ campaign to boost passengers’ confidence and improve taxi services. Metropolitan Police Commissioner Pol Lt-General Sanit Mahathaworn has presented vehicle certificates and ‘Safety Taxi’ stickers to taxi drivers who passed their training as part of their participation in the Safety Taxi campaign. The campaign strives to raise the standards and services of Thai taxis as well as regain the passengers’ trust and confidence. Pol Lt-General Sanit took the opportunity to thank all participants for their cooperation and understanding, noting that taxi drivers are the face of the tourism industry. Good services equal good image and perception, he added. After the award presentation, the police commissioner released a caravan of safe taxis to raise people’s awareness of the campaign.